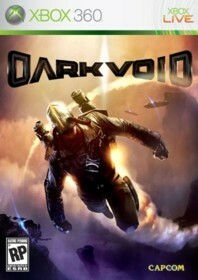 Dark Void is a Xbox 360 game in the Action genre. The game was published by Capcom and developed by Airtight Games. The game has an ESRB Rating of T (Teen 13+) and was released on 2010-01-19. The game's official site can be found at www.darkvoidgame.com. Dark Void is basically about a pilot (Will) and his companion whose plane crashes while flying through the Bermuda Triangle. While in the Bermuda Triangle, Will discovers the "Void" - which contains an evil race of beings, known as the "Watchers" along with other human survivors that have also been stranded there. The rest of the story is basically the struggle between the watchers and survivors and how Will can seal the Void to protect the world. Altogether, the story wasn't very original - but given the type of game this is it is not that important to have a compelling story anyways. As a side note, the in-game collectible journals contain some useful plot information that helps to flesh out a story a bit for those that are interested. The first thing I thought when I loaded up the game was that it was a direct rip-off of the Uncharted series for the Playstation 3. The environment is nearly identical - it takes place in a jungle, has temples, the main character has a female companion - the main voice actor is even the same as Drake from Uncharted. However, further in, the game begins to differentiate itself a bit from that amazing series - mainly the enemies are primarily robots and you get a jetpack. The concept of Dark Void had a lot of potential. It was meant to be the first game that seamlessly combined both on land and in air combat and to a certain degree it was successful. The camera angles in the flying portions of the game were pretty bad, and there were definite collision detection issues with both the environment and the enemies. Also, mapping melee and weapon pick-ups to the same button wasn't a very smart move. I can't count the number of times I went to punch an enemy and wound up picking up a weapon from the floor instead. Another complaint I have with the game is the lack of variety. There are only about five different types of enemies and most of those are just color-swapped versions of the same character model. Also, there are only about six different types of weapons and I only found three of them to be very useful. Even with the bad camera, the best part of the game was the flying sections. You can perform stunts, shoot at enemies, hijack UFO's, pilot gliders, etc.. I also never felt motion sickness even once which was actually surprising considering the amount of vertigo that this game produces. The graphics were fairly good as well and for the most part the sound fit the mood they were trying to create. The cutscenes were very disappointing - the lips weren't in sync and occasionally the sound would cut out while they were playing so I had to rely on the subtitles for some of them. Also, I experienced major slowdown during one of the game's more important battles and just died randomly on several different occasions (I'm guessing it was because I must have hit one of the game's many "invisible walls"). The actual game is only about ten hours in length, and if you like going for achievements this is a fairly easy title. However, two of the achievements are majorly glitched/buggy. I wasn't able to get the fireworks achievement initially and later found out it had an incorrect description. It says to kill ten airborn enemies using grenades. In reality you have to kill ten enemies by exploding a grenade in the air. Surprisingly, the playstation 3 trophy list for the game contains the correct description while the 360 version does not which does not make much sense. The other majorly glitched achievement is grease monkey which you get for totally upgrading every weapon in the game plus your rocketpack. For some reason the achievement will only unlock if all upgrades are done at once at an in-game locker. If you upgrade anything while just playing the game or during the between level upgrade screen there is a good chance that you will not get the achievement. The company hinted at patching the two achievements but a patch has not yet come out to address these issues. This was an okay game overall considering the whole revolutionary vertical combat/cover mechanic. Future games in this series have the potential to be great if they increase the production values and put some more time into fine tuning the camera and increasing the amount of variety in the enemies, weapons, and environments. Check it out if you want to try something new, just don't go in expecting a top tier title.